Dubai: Arsenal coach Unai Emery is eager to get the most out of his team’s friendly encounter against Al Nasr that will formally inaugurate the 15,000-capacity Al Maktoum Stadium on Tuesday. Kick-off is set for 5.30pm with Emery planning to give most of his travelling players a run against the local team. The main thing for us is to have the continuity going into this friendly match where all of our players get an opportunity against the local team. 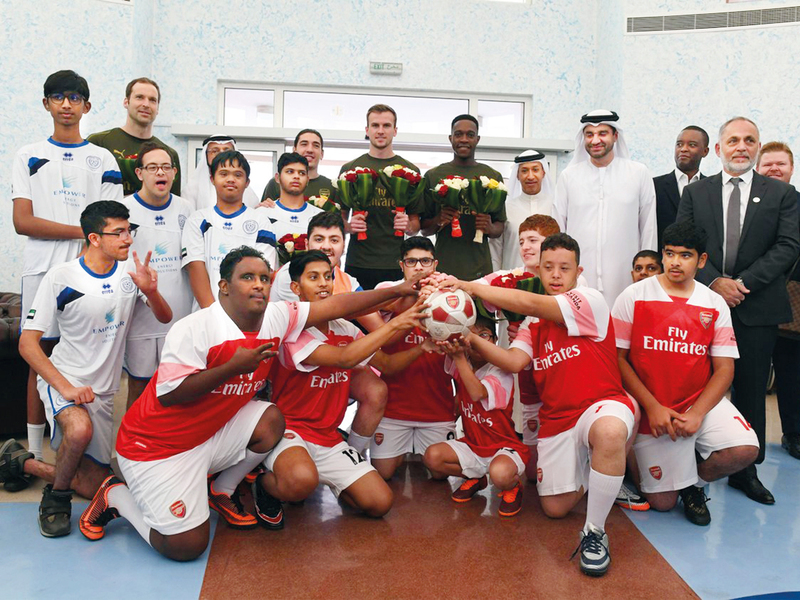 The Gunners followed up Sunday’s visit to the palace of Shaikh Hamdan Bin Rashid Al Maktoum, Deputy Ruler of Dubai and Minister of Finance, with a longer stay at the Rashid Centre for People with Determination on Monday morning. Representing the home club were coach Benat San Jose, striker Alvaro Negredo — who used to play for Spain and Manchester City — and Ahmad Khoury, vice-president, Board of Directors, at Al Nasr. Al Nasr’s Spanish coach Benat San Jose, who was at Real Sociedad before Emery during their playing careers, has invited a handful of players from other clubs to be part of the friendly match. “If we were in London, then we would have been doing the same things that we are doing here,” said Emery. “The main thing for us is to have the continuity going into this friendly match where all of our players get an opportunity against the local team. Emery, who replaced long-time coach Arsene Wenger last season, has done well with the Gunners since taking over the North London club. Arsenal were thrashed 5-1 by title aspirants Liverpool at the end of 2018, but since the Gunners have notched up eight wins and a draw in the next 11 matches played. Following their 2-0 win against Manchester United on March 10, Arsenal have moved into fourth overall in the Premier League standings with 60 points, just one shy of cross-city rivals Tottenham Hotspur (61), while Liverpool (76) and Manchester City (74) are headed for a mouth-watering race for the title. However, with just eight rounds remaining in the league, Arsenal will have to be wary of no further slip-ups as Manchester United (58) and Chelsea (57) keep up their chase for fourth spot and Uefa Champions League action for next season. Arsenal’s immediate assignment after returning to London will be at home against Newcastle United on April 1 followed by a visit to Goodison Park against Everton on April 7. Running parallel will be their home and away Uefa Europa League quarter-finals against Napoli on April 11 and 18, respectively. Tickets for Tuesday’s friendly have been priced at Dh100 and Dh150, and are already on sale on Platinum List and at the new stadium in Oud Metha, Bur Dubai.